Chapter 1. Why Project Based Learning? When asked how students learn these qualities of an ideal graduate, teachers and administrators say that it sometimes happens in traditionally taught classrooms, but they acknowledge that it's inconsistent at best. Our workshop participants then go on to learn how project based learning (PBL) provides opportunities for students to build these qualities, as well as more deeply learn traditional academic content and understand how it applies to the real world. Prepares students for college, careers, and citizenship. Helps students meet standards and do well on tests that ask students to demonstrate in-depth knowledge and thinking skills. Allows teachers to teach in a more satisfying way. Provides schools and districts with new ways to communicate and to connect with parents, communities, and the wider world. Let's take a closer look at how PBL benefits students, teachers, and schools. Elementary school children are typically motivated to learn and do good work in school because they arrive with a natural desire to learn about the world and they want to be able to read, write, and use numbers. They also tend to like and want to please their teachers, and the teaching methods—especially in the primary grades—often still have an element of fun and play. But even young students may grow tired of worksheets, drills, or other traditional instructional methods if such approaches are used too much. Once they reach middle school and especially high school, many students report that they are not engaged at school for much of the time. Some might still be motivated by the desire to earn good grades and please their teachers and parents, but far too many simply go through the motions of listening to their teachers, completing assignments, doing homework, and studying for tests. Even many "model" students with high GPAs who take challenging courses admit that, although they know how to play the game of school, they don't find their work intrinsically interesting or meaningful. Generally speaking, students are driven to learn by external factors, not the real "need to know" that is one of the keys to PBL's motivational effect. Grant Wiggins, author and cofounder of Understanding by Design, found similar results when he recently surveyed students at a "typical American high school" in a Midwestern suburban community. Most students reported being bored much of the time and suggested that teachers should "make learning active and fun," do more "hands-on activities," and provide opportunities to "discuss my ideas with others" (Wiggins, 2014). The results of these surveys clearly point to the need for instruction that's more engaging, and project based learning is just that. Interesting and relevant topics, issues, and challenges are central to every well-designed project. Interaction with the teacher is likewise baked into the whole process, as we describe in detail in the following chapters. Discussions and debates occur frequently in projects, whether as a whole class or in small groups. Most projects today involve technology to some extent, and student presentations are also a key element. A survey of gifted high school students showed they, too, were often bored and disengaged from classroom learning (Kanevsky & Keighley, 2003). The researchers listed five features that distinguished "boring from learning experiences": control, choice, challenge, complexity, and caring teachers. Once again, project based learning fits the bill. Experienced teachers know that when students are deeply engaged by a topic or a task, a lot of classroom management issues fade away. Students who used to disrupt class behave differently when they're doing active work on a project that engages them (Lambros, 2002). Students who previously did not do their assignments, or turned in shoddy work, become more responsible and step up their work quality when they care about a project. Students drop out of school for many reasons, and one of them is being bored and disengaged. According to a 2006 report on high school dropouts (Bridgeland, Dilulio, & Morison), the response "classes were not interesting" was the top vote-getter in surveys, a reason given by 47 percent of students. When asked in the survey about what might help them stay in school, 81 percent of the students said there should be more real-world learning. The report's authors recommended that schools "improve teaching and curricula to make school more relevant and engaging and enhance the connection between school and work" (p. iv). This is exactly what well-designed project based learning does. Much of the talk about getting students "ready for college and career" focuses on making sure they take the right courses and learn enough in math, science, English/language arts, history, and other subjects. But being ready for the next step beyond the K–12 school system has another aspect, which has more to do with attitudes, habits, and skills that fall outside the boundaries of traditional academic disciplines. The consensus is clear: students need more than basic subject-area knowledge. The competencies and personal qualities included in these various lists have been given many names: 21st century skills, cross-curricular skills, soft skills, interdisciplinary skills, habits of mind and work, deeper learning, and college- and career-readiness skills. We call them "success skills." Some are as old as Socrates; some are products of the modern age. But can traditional schooling meet the need to teach them? As we mentioned at the beginning of this chapter, many of the things educators, parents, colleges, and employers want to see in a graduate tend to fall between the cracks of traditional subject areas and teaching methods. Some teachers might teach, say, critical-thinking skills as they pertain to a specific discipline, but others may not at all. And even if such opportunities are provided, they may only be implicit or assumed to be embedded in an assignment or activity. But a good project brings it all together like nothing else can. In PBL done well, students not only find themselves needing to use college- and career-readiness skills; they are explicitly taught them, assessed on them, and asked to reflect on their growth in them. Students who graduate from school systems in which they have completed multiple projects over the years will have had many more opportunities to gain these skills, and systematic support in doing so, than students who have had only scattered or unfocused opportunities. By the way, we are not saying that students should learn college- and career-readiness skills at the expense of learning how to read, write, do math, and know something about history, literature, and other traditional subjects. Even though information on any topic is readily available in our digital age, people still need some background knowledge to be able to make sense of the information and to be well-rounded, culturally literate members of society. Learning key knowledge and understanding should always be one of the twin goals of a project, along with gaining key success skills. After all, students need something to think critically or communicate about in a project, and they can't solve a problem simply by applying a process devoid of content knowledge. When some educators and parents hear about PBL, they might say, "But that's not how students are taught in college, so wouldn't we be doing them a disservice? Shouldn't they learn to listen to lectures, take notes, and take tests that measure how much information they've memorized?" We offer two responses to this concern. First, it's true that listening and note taking are important skills that students should practice in high school, but such opportunities can be included within a project. Contrary to some stereotypes, there's still room for lectures in PBL. During a project, the best way for students to learn something—once they see a genuine need to know it—might, in fact, be a lecture by the teacher. Or they might be called upon to interview an expert and take notes. Likewise, a test on content knowledge might be an effective and necessary assessment tool in a project. Second, as students advance through college they will encounter more and more courses that are not lecture based. Even at fairly traditional colleges and universities, undergraduates will be asked to work in teams, to use knowledge in real-world applications, to analyze problems, and to communicate findings to an audience. A growing number of postsecondary institutions are using an explicitly project-based approach, particularly in the fields of engineering, architecture, and business. Olin College of Engineering, for example, emphasizes collaborative projects throughout its curriculum. Harvard University's undergraduate Applied Physics 50 course is entirely project based (Perry, 2013). Stanford University's popular Design for Extreme Affordability and MIT's D-Lab are multidisciplinary project based courses in which students develop products and services for the world's poor. Additionally, students who develop a sense of being independent learners through PBL are well prepared for the self-advocacy and initiative it takes to thrive in a college environment. Although the findings are preliminary, because most of its graduates have not yet completed college, students from the PBL-infused New Tech Network high schools have been found to have high rates of persistence into their second year of college (New Tech Network, 2014). Envision education schools show similar results. A 2014 study found high rates of college success among students from high schools that feature "student-centered instruction," which researchers defined as including project based teaching, collaborative learning, relevant curriculum, and performance-based assessments (Friedlaender, Burns, Lewis-Charp, Cook-Harvey, & Darling-Hammond, 2014). For example, 97 percent of the graduates from City Arts and Technology High School in San Francisco who enrolled in four-year colleges were still enrolled in their fourth year, as were 69 percent of the graduates from Life Learning Academy in Oakland. Both schools far exceeded national averages for their high-minority populations, which included many students who were the first in their families to attend college. School systems designed more than a century ago to send workers into that era's industrial economy emphasized only the basics: the 3 Rs and a little knowledge of history and civics. Factory jobs did not require much else and mainly called for the ability to follow routines. Although jobs like that still exist, they're fewer in number, and even those require more complex skills than they used to. In today's "knowledge economy," success at most jobs demands the kinds of skills seen on the lists presented earlier in this chapter. The report Dancing with Robots: Human Skills for Computerized Work (Levy & Murnane, 2013) makes the case that because of technology, "the future of middle-class work will necessarily have to rely on uniquely human brain strengths" such as flexibility, solving nonstandard problems, and working with new information and communicating it to others (p. 4). On the job, and even in college, people also benefit from having leadership skills. It pays to be able to organize a team, get others to do their best work, and manage a complex, extended set of tasks that must be accomplished by a deadline. Projects provide students—sometimes especially those who are not the typical leaders in a classroom—with multiple and varied occasions to build these kinds of skills. Equally valuable are self-management skills, such as being able to organize one's time and tasks, work independently, handle stress, and take the initiative. Rigorous projects require all of the above. Finally, it's a fact in today's economy that most people will change jobs several times, requiring them to stay flexible and to know how to learn new skills. Students get practice in this by taking on new and varied roles in projects. In a shifting economy, personal qualities such as persistence and resilience—also known as grit—will come in handy. A project-based environment in school helps build these capabilities, as students investigate questions and issues that do not lead them down a straightforward path. It's almost a given that any project will involve unexpected twists and turns, setbacks, reconsideration of ideas, and recognition that something more must be learned. Becoming an informed, active citizen in a community, state, or nation requires many of the same skills asked for by colleges and employers. Whether it's discussing issues with fellow members of a community, asking a government or a corporation to address a need, negotiating a bureaucracy to get something done, or simply voting in an election, it pays to be able to think critically, evaluate information, communicate well, and make defensible decisions. And just as in the workplace, citizens in a diverse society must be able to work well together to identify and solve problems. Finally, we should also note that PBL helps prepare young people for life in general, where adults tackle many "projects," from planning a wedding to building a toolshed to taking a road trip. Everyone can benefit from learning how to set goals, plan a complex undertaking, gather resources, and successfully complete a "performance-based assessment." Most states in the United States, whether they have updated their own standards or adopted the Common Core State Standards (CCSS) for English/Language Arts and Mathematics, are asking students to reach new kinds of learning goals, for which PBL is especially well suited. A growing sense is developing in the United States and around the world that knowing a lot of facts (which older standards documents often listed at length) is not enough for today's students. Information in the modern world is easily accessible; what's needed is the ability to ask the right questions, find the best information, and apply it to the real world. So rather than "cover content," these standards ask teachers to help students gain deeper conceptual understanding and learn how to apply their knowledge. Texas Essential Knowledge and Skills for English Language Arts and Reading: "Students work productively with others in teams." Indiana Academic Standards, English Language Arts: "Create engaging presentations that include multimedia components." Virginia Standards of Learning, English: "Analyze, evaluate, synthesize, and organize information from a variety of sources to produce a research product." "Aligned with CCSS" is a claim made all too readily these days by school district curriculum committees, publishers of instructional materials, and purveyors of educational tools and programs. But to say project based learning "aligns" with the Common Core State Standards is an understatement. Although we can't claim that PBL is the only way to achieve the goals of the Common Core, it is one of the best ways. As we said in the preface, PBL's recent popularity is evidence that educators are recognizing this. Fewer standards, more depth (ELA and mathematics)—Well-designed projects have always emphasized deep conceptual understanding and critical thinking when solving problems, developing and answering a driving question, and creating high-quality products. More emphasis on reading informational text in a variety of content areas (ELA)—Many projects are interdisciplinary and create a purposeful context for reading a wide variety of texts to find information, from reference books to new media, from expert interviews to web pages. More emphasis on inquiry and evidence-based reasoning (ELA)—Close reading of a text in search of meaning is a form of inquiry—an important skill that is often built into a project. The standards also call for students to ask questions, do research, evaluate sources, and develop well-supported answers—processes that are fundamental to PBL. Real-world applications (mathematics)—The Common Core's Standards for Mathematical Practice highlight the ability to apply math to solve "problems arising in everyday life, society, and the workplace"—exactly what happens in a good project. Second, a project enables a teacher to teach several specific standards in one context rather than as isolated lessons. For example, students could learn, through various assignments and activities scattered throughout a year of traditional instruction, how to make multimedia presentations, have collegial conversations with peers, and conduct research to investigate a self-generated question (all of which appear in new standards for ELA). But imagine how much more frequent and focused the opportunities to build these skills would be if students were engaged regularly in projects that require them every time. Most ELA standards for reading and language, as well as standards for mathematics, could be taught in the context of projects. But some specific standards for ELA are especially well suited for PBL, as shown in Figure 1.1. Writing 6. Use technology, including the Internet, to produce and publish writing and to interact and collaborate with others. Many projects feature a written product created with word-processing tools and self-publishing websites. Student project teams can use online tools for sharing documents, conducting meetings, and keeping track of tasks and deadlines. Writing 7. Conduct short as well as more sustained research projects based on focused questions, demonstrating understanding of the subject under investigation. Most projects include research of some sort, whether it's reading a variety of sources to develop and support an answer to a driving question, conducting a scientific study, or interviewing experts, community members, or end users to inform the creation of a product. Student-generated questions that guide investigations are a hallmark of PBL. Speaking and Listening 1. Prepare for and participate effectively in a range of conversations and collaborations with diverse partners, building on others' ideas and expressing their own clearly and persuasively. In a project, when students work in teams, they have regular and multiple opportunities to discuss plans, ideas, and products. They may also talk with outside experts, mentors, and family and community members. Speaking and Listening 4. Present information, findings, and supporting evidence such that listeners can follow the line of reasoning and the organization, development, and style are appropriate to task, purpose, and audience. Projects culminate when students present their work to a particular public audience, depending on the nature of the project. In addition to showing their final product or explaining their answer to a driving question, students defend their reasoning and describe their process. When students present project work to a public audience, they must be clear and persuasive, choosing the most appropriate digital media and creating effective visual displays. Speaking and Listening 6. Adapt speech to a variety of contexts and communicative tasks, demonstrating command of formal English when indicated or appropriate. Many projects require students to interact with other adults, not just teachers, and make presentations to audiences beyond their classmates and teacher, creating a variety of opportunities to practice formal speech. For states that are members of either the Smarter Balanced Assessment Consortium (SBAC) or the Partnership for Assessment of Readiness for College and Careers (PARCC), PBL is an excellent "test prep" methodology—although most PBL practitioners would shun that term. One part of the tests these organizations are developing will be a performance task, in which students will have to do something rather than simply select the best multiple-choice answer. For example, to measure research skills, the SBAC test asks students to read and compare various points of view on an issue, then write an evidence-based argument for a real-world situation (Smarter Balanced, 2014). Students who are used to the demands of a project will be comfortable with these kinds of tasks when they sit down to take the test. PARCC is developing similar research simulation tasks. Both groups are creating performance tasks for mathematics that call for modeling and application in a real-world context or scenario—familiar territory for students who have been taught with PBL. The Next Generation Science Standards (NGSS) are also a good fit with PBL. The standards were developed by a group of 26 states, with a writing team coordinated by Achieve, Inc. Like Common Core, NGSS marks a shift to a "focus on understanding and application as opposed to memorization of facts devoid of context" (Next Generation Science Standards, 2013). In 2014, College Board President David Coleman, who helped write the Common Core State Standards, announced changes to the SAT test for 2016. Many of the changes reflect the PBL-friendly trend seen in CCSS and other recent state standards, such as a greater emphasis on thinking skills in ELA, coverage of fewer topics in math, and "problems grounded in real-world contexts." The Evidence-Based Reading and Writing section will feature "continued emphasis on reasoning alongside a clearer, stronger focus on the knowledge, skills, and understandings most important for college and career readiness and success." The Math section will feature "multistep applications to solve problems in science, social science, career scenarios, and other real-life contexts. Students will be presented with a scenario and then asked several questions about it. This allows students to dig into a situation and think about it, then model it mathematically." Advanced Placement courses and tests are also changing in ways that support greater use of PBL. According to the College Board, AP is shifting toward a "greater emphasis on … inquiry, reasoning, and communication skills" and "a balance between breadth of content coverage and depth of understanding." The new exam and curriculum for AP Physics, AP Biology, and AP U.S. History are the first to reflect this shift. Consider and evaluate multiple points of view to develop their own perspective on complex issues and topics. Hone critical- and creative-thinking skills. Ask questions and conduct inquiry and investigation. Make a public presentation, performance, or exhibition. Another well-known test is considering changes that move in the direction of PBL. In Leading Assessment into the Future, a report for the National Assessment of Educational Progress (NAEP), a panel recommends using new technologies to "assess new constructs, such as critical thinking, problem solving, and collaboration" (NCES, 2012, p. 9). An international test that already reflects the goals of PBL is the Programme for International Student Assessment (PISA). The test is given every three years to 15-year-old students in over 65 countries in schools that join the Global Learning Network, run by the Organisation for Economic Co-operation and Development (OECD). The network's goal is to "help more students succeed at globally competitive levels" (America Achieves, n.d.). PISA assesses how well students can apply their knowledge of reading, mathematics, and science in real-world contexts. It has recently begun offering a test of "creative problem solving" that measures students' ability to respond to a "non-routine situation"—which is exactly what every good project is (OECD, 2014). What we need are schools organized in ways that put the joy back into teaching and that do not confuse rigor with rigor mortis. In today's era of standards, testing, and accountability, many teachers feel constrained in their choices about curriculum and instruction, or are actually told they must teach in a certain way. In schools where raising test scores is the be-all and end-all, a "test-prep" approach dominates, which might entail following a prescribed script for a lesson and using only approved instructional materials. All teachers must be on the same page on the same day, following a pacing guide. In our PBL workshops we've noted that many teachers who have entered the classroom in recent years, especially in the elementary grades, have not even had the opportunity to plan a unit. It's always been done for them. Schools dominated by the need to raise test scores claim to have no time for "frills" (the arts and other untested subjects), connecting with the community, using technology in new ways, or teaching students how to work in teams and make presentations. They say it's impossible to spend the time it takes to create high-quality products students can be proud of. Pedagogies such as PBL are discouraged or even outright forbidden because they're seen as too unstructured and inefficient in terms of "covering" the standards. Many teachers faced with this situation still find ways to inject their personality into the classroom and make their teaching as creative and lively as they can. Others go along with the program, but grow weary of the constraints and hate seeing their students lose interest in learning when it's textbooks, worksheets, and drills every day. Some teachers might even leave the profession or move to a charter or private school where they can teach in a more satisfying way. Most teachers like to plan their own lessons and units, not simply "deliver instruction" based on off-the-shelf materials or a long march through a textbook. They like to teach about topics and issues they and their students find interesting. They want to see their students get actively engaged in learning, and they like learning new things themselves. They enjoy engaging closely alongside young people, rather than always directing a whole group from the front of the classroom. All of these things happen in a PBL environment. We get feedback along these lines in our PBL professional development workshops, where teachers often say, "This is how I've always wanted to teach!" Some veteran teachers might put it differently: "This is how I used to teach! "—although they might have to admit that their projects back in the day were not as rigorous as they should have been. In either case, they now feel liberated once they see that PBL can work in a standards-based world. The appeal of PBL to teachers was confirmed by a 2010 study of a project-based high school economics curriculum, in which teachers who used the PBL approach felt more satisfied with their teaching methods than those who did not (Finkelstein, Hanson, Huang, Hirschman, & Huang, 2010). You can still have structure and use traditional instructional tools in a project-based approach. Especially in their first few projects, we advise teachers to design the key pieces of the project in advance and map out a project calendar in detail, allowing for more limited student input than you might have assumed PBL requires. As teachers gain experience with PBL, they begin to see how much they are able to let go and trust the process. And rest assured, traditional tools such as lectures and structured lessons have a place in PBL—when and as needed. Try it—you might like it! And your expertise still has a place. Some high school teachers tell us, after they've done their first project or two, that although they found it challenging to work with teenagers in new ways, it was more fulfilling and, well, fun. And they could still give that wonderful lecture about Civil War battles or the DNA evidence for evolution, but now students paid more attention because they saw its purpose in the context of an engaging project. We've talked about what PBL can do for students and teachers—but how about what it can do for a school as a whole or a school district? Let's start with a couple of stories. Katherine Smith Elementary School is a public K–6 school in San Jose, California, part of the Evergreen School District. It has a high number of English language learners, and most of its students come from low-income families. Faced with the need to dramatically improve student achievement and reenergize its culture of disengaged students and parents, the school reinvented itself in 2012. With an eye on the demands of the Common Core, teachers and newly hired principal Aaron Brengard made a commitment to "deep learning" and teaching students how to think critically, collaborate, communicate, create, and innovate. They adopted a "college bound, no excuses" attitude, brought in technology, and beautified the campus. And they adopted project based learning as a primary teaching method in all grades, for all students, providing teachers with extensive professional development and coaching. The parent community, when they were informed about the school's new direction, rallied in support. The school's turnaround efforts have been paying off, and it's now a very different place. The other story involves two school districts: Metropolitan Nashville Public Schools in Tennessee and York County School Division, southeast of Richmond, Virginia. Both partnered with the Buck Institute for Education in a multiyear effort to implement project based learning in all their schools by providing teachers with extensive professional development and creating systemic support. In 2014, both districts took a bold step and asked students, teachers, and administrators to conduct a public exhibition of the students' project work. York asked each of its 19 schools to conduct its own event in April or May, so the format of the exhibitions varied. Some were held during the day and others were evening events. Some showcased particular projects, subject areas, or grade levels, whereas other exhibitions were more like fairs, with tabletop displays of a variety of projects, hosted by students. Teachers, other students, parents, community members, and representatives of local businesses attended. Metro Nashville decided to hold one big exhibition in April from 8:00 a.m. to 8:00 p.m. at a local community college's exhibit hall. More than 300 projects were on display, hosted by student teams. Over 900 people attended, including middle school and high school students, parents, teachers, administrators, and partners from the business community. In both of these stories, the schools and districts met a need to communicate with stakeholders in new ways. Traditionally, community members learn about a school or district through stories in the local media and word-of-mouth. Parents might also hear from their children and teachers, attend events on campus, read newsletters, or visit websites. A key piece of information these people use to judge the quality of a school or district is its test scores. But as any teacher would tell you, a test score is only a snapshot of what happens in a classroom; students learn more than what's measured on standardized tests. Parents see evidence of that when their children bring work home from school, at a parent-teacher conference, or when they visit a classroom on Open House night. A public exhibition of students' project work takes this a big step further, by helping schools and districts tell more of the story. What Katherine Smith, Metro Nashville, and York are doing, then, is more than a celebration of students' accomplishments and a way to build a shared vision for a new form of instruction. It's more than an opportunity for students to present their work to an audience, which is one of the essential elements of PBL that we discuss in the next chapter. A public exhibition is a powerful way to tell stakeholders, "We're more than our test scores." Some schools and districts that do not have high test scores have adopted PBL as an instructional strategy because they believe it can improve student achievement on traditional measures, but meanwhile helps them meet other goals. In these places, a public exhibition of project work sends the message that, despite the current scores, "Great things are happening here." Students are not only learning important content knowledge; they're also gaining skills such as critical thinking, problem solving, collaboration, and self management. And they're fully engaged in their education. According to instructional coach Sonya Mansfield of Metro Nashville, many people in the city have a negative view of the public schools and the students in them. But at the PBL exhibition, "When people from the business community and parents came in, it gave them a different perspective on the students and what they're learning." For schools and districts whose test scores are generally high enough to satisfy their stakeholders, a public exhibition of students' project work can meet a related but slightly different need. Teachers and school leaders may want to tell parents and the community, "We're not satisfied with high test scores alone. We want our students to learn in more depth, build 21st century success skills, and gain real-world experience. We want them to care about what they do at school, not just their grades. PBL is how we're doing it, and this is what it looks like." As Eric Williams, past superintendent of York County Schools, said about the PBL exhibition, "It shows we don't just have a test-prep mentality. Parents of high-achieving students concerned about test scores saw the depth of learning." Many schools today want to be more closely involved with parents, local businesses, community organizations, and people in the outside world rather than remain islands in their communities. Projects can present many opportunities for a school to connect with its community. Teachers can contact local businesses or other organizations to get ideas for projects, to find resources for students, or to ask them to act as clients, mentors, and audiences. For example, in the Farmer Appreciation Project described in the Appendix A, 1st graders planned and hosted an event that brought dozens of local farmers to the school. To launch the Home Sweet Home project (see Appendix A), teachers contacted an education expert at the Detroit Zoo about writing a letter to 4th graders asking them to design new animal habitats. A parent who had worked at a zoo gave students feedback on their plans during the project, and the Detroit Zoo's education director attended their final presentations. In Telannia Norfar's high school math class in Oklahoma City, students act as consultant teams who work with local businesses to help improve their services or marketing. Some schools want to take it a step further, and they involve their students in addressing real-world issues and solving problems that have a significant impact on others. Project based learning allows them to accomplish these goals. For example, at Maplewood High School in Nashville, teacher Danette McMillian organized an economics/personal finance project that included working with real estate agents and local bankers and focused on increasing home ownership in the community (see The Home Ownership Project in Appendix A). Pamela Newman, another Nashville teacher, led her 5th graders at Dupont Haley Middle School in a project that grew out of her students' interest in one of their classmates who was a cancer survivor. The class decided to raise funds for the local children's hospital by conducting an event that included dinner and exhibits based on student research on cancer and its treatments (see The Cancer Project in Appendix A). A project with international reach was conducted by Leah Penniman of Tech Valley High School in Rensselaer, New York. Her 9th graders met the need of a nonprofit organization that works in Haiti to design a simple, low-cost solar oven. We're convinced that project based learning is an instructional strategy that can enable you and your students to go beyond content coverage and develop the deep understandings and success skills needed to thrive in today's complex world. 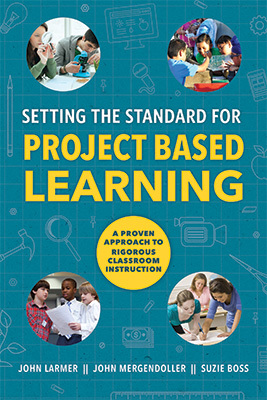 As we explained in the preface, we've written this book to present a new vision of PBL—what we call Gold Standard Project Based Learning—and to give you concrete suggestions for infusing your own teaching with this vision. We describe Gold Standard PBL in the next chapter, with a review of the history and theory from which it derives, and then describe the research that supports it. Later chapters explain how to make PBL a reality your classroom, school, and district. Rather than going on to Chapter 2, readers who want to see what PBL looks like in practice might want to go directly to the Appendix A. The stories from real teachers about real kids provide compelling testimony about the power of PBL.